Background/Purpose: To describe the clinical, immunological and histopathological profile of patients with primary Sjögren syndrome (SjS) presenting with isolated circulating anti-La/SS-B antibodies in the absence of concomitant anti-Ro/SS-B antibodies in a large international cohort of patients. Methods: The Big Data Sjögren Project Consortium is an international, multicentre registry of primary SjS patients fulfilling the 2002 AE classification criteria. By January 2016, the participant centres had included 8310 patients. Determination of anti-Ro/SS-A and anti-SS-B antibodies were made using commercial tests used in daily practice. Patients were classified in 4 groups: A) Double positivity (Ro+La+); B) Isolated Ro positivity (Ro+La-); C) Isolated La positivity (Ro-La+); and D) Biopsy-proven immunonegative (Ro-La-). Results: Anti-Ro/SS-A and anti-SS-B antibodies were tested in 8213 (99%) patients: 3372 (41%) were Ro+La+, 2546 (31%) Ro+La-, 222 (3%) Ro-La+ and 2073 (25%) were biopsy-proven Ro-La-. Epidemiologically, age at diagnosis of Ro-La+ patients was similar to the two Ro+ groups and was 5.5 years lower than that observed in Ro-La- patients (p<0.001). Clinically, Ro-La+ patients had a similar frequency of ocular dryness than Ro-La- patients (a figure significantly higher in comparison with the two Ro+ groups, p<0.001), while the frequency of oral dryness was similar to the Ro+ groups and significantly lower than that reported for the Ro-La- group (p<0.001) (Figure 1). With respect to diagnostic tests, Ro-La+ patients showed similar figures in comparison with the other groups but a significant higher frequency in abnormal diagnostic tests (salivary flows and parotid scintigraphy, p<0.001). Minor salivary gland biopsy was carried out in 147 (66%) out of the 222 Ro-La+ patients, and showed Chisholm-Mason 3-4 grades in 103/147 (70%), a figure significantly lower than that reported for the 2 Ro+ groups (p<0.001). 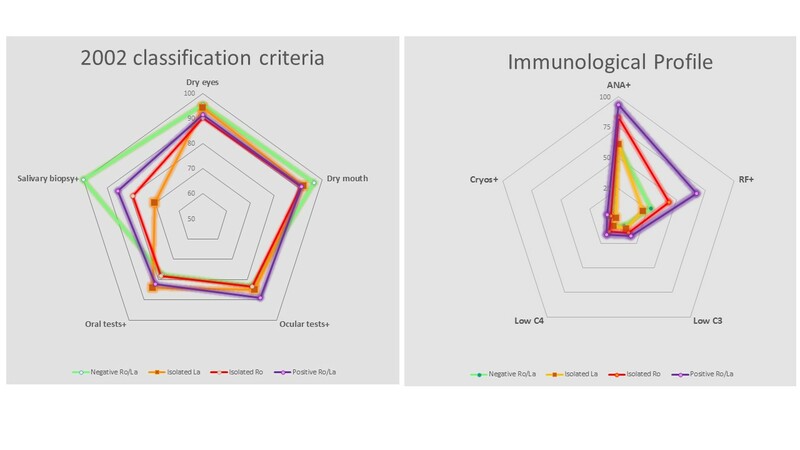 Immunologically, Ro-La+ patients showed a similar immunological profile than that reported for Ro-La- patients, with a significant lower frequency of ANA, RF, hypocomplementemia and cryoglobulinemia in comparison with the 2 Ro+ groups (p<0.001, Figure 1). Conclusion: In the largest reported cohort of patients with primary SjS fulfilling the 2002 AE classification criteria, only 3% of patients had isolated anti-La/SS-B antibodies. This small subset of patients presents a specific clinical and immunological profile that mix some features characteristic of immunonegative patients and some of patients carrying anti-Ro/SS-A antibodies. Further studies are required to confirm this isolated anti-La positivity and should evaluate the differences in systemic activity and outcomes of this subset of patients with respect to the other immunological groups. Disclosure: P. Brito-Zerón, None; N. Acar-Denizli, None; M. Zeher, None; A. Rasmussen, None; R. Seror, None; E. Theander, None; X. Li, None; C. Baldini, None; J. E. Gottenberg, None; D. Danda, None; L. Quartuccio, None; R. Priori, None; G. Hernandez-Molina, None; A. A. Kruize, None; V. Valim, None; M. Kvarnström, None; D. Sene, None; R. Gerli, None; S. Praprotnik, None; D. A. Isenberg, None; R. Solans, None; M. Rischmueller, None; S. K. Kwok, None; G. Nordmark, None; Y. Suzuki, None; R. Giacomelli, None; V. Devauchelle-Pensec, None; M. Bombardieri, None; B. Hofauer, None; H. Bootsma, None; J. G. Brun, None; G. Fraile, None; S. E. Carsons, None; T. Gheita, None; J. Morel, None; C. F. Vollenweider, None; F. Atzeni, None; S. Retamozo, None; I. F. Horvath, None; K. Sivils, None; T. Mandl, None; P. Sandhya, None; S. De Vita, None; J. Sánchez-Guerrero, None; E. van der Heijden, None; V. Moça Trevisano, None; M. Wahren-Herlenius, None; M. Ramos-Casals, None. Brito-Zerón P, Acar-Denizli N, Zeher M, Rasmussen A, Seror R, Theander E, Li X, Baldini C, Gottenberg JE, Danda D, Quartuccio L, Priori R, Hernandez-Molina G, Kruize AA, Valim V, Kvarnström M, Sene D, Gerli R, Praprotnik S, Isenberg DA, Solans R, Rischmueller M, Kwok SK, Nordmark G, Suzuki Y, Giacomelli R, Devauchelle-Pensec V, Bombardieri M, Hofauer B, Bootsma H, Brun JG, Fraile G, Carsons SE, Gheita T, Morel J, Vollenweider CF, Atzeni F, Retamozo S, Horvath IF, Sivils K, Mandl T, Sandhya P, De Vita S, Sánchez-Guerrero J, van der Heijden E, Moça Trevisano V, Wahren-Herlenius M, Ramos-Casals M. Isolated Anti-La/SS-B Positivity in Patients Diagnosed with Primary Sjogren Syndrome: Analysis of 222 Patients from the Sjogren Big Data Cohort [abstract]. Arthritis Rheumatol. 2016; 68 (suppl 10). 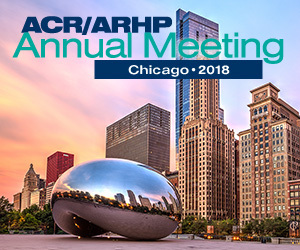 https://acrabstracts.org/abstract/isolated-anti-lass-b-positivity-in-patients-diagnosed-with-primary-sjogren-syndrome-analysis-of-222-patients-from-the-sjogren-big-data-cohort/. Accessed April 21, 2019.